In response to the Isla Vista rampage attack, Ezra Klein points out that publicizing the crimes only inspires others. This is the same point I made here in response the Columbia rampage attack. The goal of gun rights advocates is to allow individuals the right to own and carry firearms. That seems clear, even if it results in such questionable policies as allowing convicted felons or those who are a danger to themselves or others because of mental illness. One of the immediate objective of many gun control efforts is to keep guns from those two groups. Other objectives are to prohibit the sale of “military style” rifles (as opposed to military rifles). A more long term or larger goal is to address “gun violence” (as opposed to violence per se, oddly). But simply “addressing” gun violence does not define a logical stopping point. According to the FBI, firearm-related homicides have fallen from 17,075 in 1993 to 10,869 in 2008 – more than a 40% decline. The number of nonfatal gun violence incidents has declined from 1,222,701 in 1993 down to 331,618 in 2008 before rising to 414,562 in 2011 – a two thirds decline. As an example of the problem, Michael Bloomberg’s new effort Everytown for Gun Safety has an immediate goal of increasing the number of background checks performed prior to gun sales, with a special emphasis on gun shows and internet sales. But his prior support for “assault weapon” bans suggests that this is simply a first step in a longer run process. I don’t see any benchmarks or performance measures anywhere on the website, so it is impossible to know in advance when or how the group will accomplish its goals. Some gun rights advocates believe that the long run goal is complete confiscation of guns. That seems overly paranoid to me, even though Dianne Feinsten has stated her desire to confiscate “assault weapons” and a New Jersey state senator expressing her wish for a bill that would “confiscate confiscate confiscate” . I think that gun control groups would be more successful if they were upfront about their long run goals and included benchmarks and performance measures in their public statements. That would allow gun rights groups some measure of comfort that background checks are not simply the first step towards confiscation. Yesterday was the deadline for residents of New York state to register their “assault weapons” with the state. This is part of the SAFE act, which also prohibits those residents from purchasing semi-automatic rifles with detachable magazines and features such as pistol grips and telscoping stocks. Those features are putatively ‘military’ in purpose, but have civilian purposes as well. There is anecdotal evidence that residents are failing to comply. Sound public policy is best supported by the state publicly announcing the number of registrations as soon as is possible. That will allow New York voters an opportunity to determine the effectiveness of the law and whether or not they support its continuation. I just saw this NY Times article from April 2013. Although unspoken, the obviously most effective way to fight back is to use a gun. The most recent shooting at Fort Hood was precipitated by the shooter being denied a request for leave. This is the latest in a long list of rampage killings. Like many in the “Running Amok” style, the killer suddenly starts a killing spree until he (nearly always a he) runs out of energy or confronts armed opposition and then commits suicide. In other cases, the killer carefully plans an attack over a number of years. Some commit suicide when their plans are frustrated, but others do not. Psych tests don’t necessarily work. Like the Navy Yard shooter, The Fort Hood shooter had recently passed a psychological evaluation. This has precipitated a re-evaluation of Fort Hood’s psych evaluation system. In the Navy Yard shooter’s case, he simply lied about his condition. A recent Slate article puts out the idea that these killers aren’t really mentally ill at all, they just have anger management issues. This casts into doubt the efficacy of required psych testing before an individual is allowed to purchase a gun. The faster a shooter confronts armed resistance, the lower the number of victims. In many instances of mass killing, the event ends when the killer commits suicide. This often occurs when they confront armed resistance, although the Columbia Mall shooter killed himself when he realized that all the potential victims had run away. The obvious policy prescription is to allow armed guards in schools, concealed carry in military bases and loosen concealed carry laws in general. In an earlier post, I showed that fatalities from accidental firearm injuries have dramatically declined. David Yamane brought up the point that the result could be due to increased quality of medical treatment. That critique could be addressed by examining long run trends in national non-fatal injury rates. Unfortunately, national data only extends back to 2000. Another approach would be to examine fatality rates for other injuries. If fatality rates from firearm injuries declined more rapidly than the rates from other injuries, increased safety may be the reason. I didn’t find the results all that compelling. I’m back now with another attempt. While national non-fatal injury rates aren’t available, California non-fatal injury rates are available here going back to 1991. 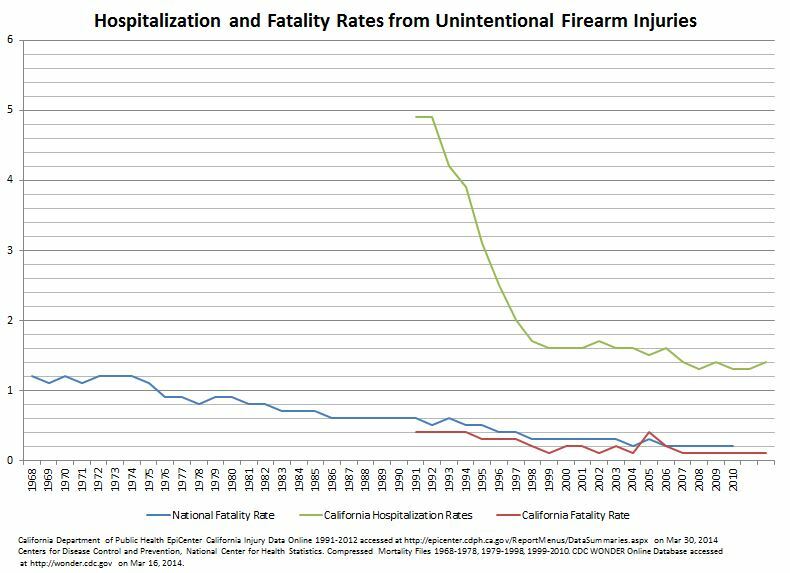 Plotting California non-fatal and fatal injury rates for accidental firearm discharges against national mortality rates, we see that the decline in California fatal injury rates matches the national decline. It is therefore very likely that the sharp decline in California non-fatal injury rate matches an unseen decline in the national rate. That is especially so because of California’s size. We therefore have good evidence that there has been a long-run decline in national accidental firearm injuries, both fatal and non-fatal. I don’t believe that existing gun owners suddenly became safety nuts. I can think of three possible candidates. First, the decline in rifle ownership during that time period. I don’t really believe that. Second, gun control efforts have been especially effective in denying guns to careless potential owners. This could occur if potential owners who are put off by small impediments to ownership are also the ones who have little interest in learning about safety. Third, a composition effect caused by the overall decline in crime. This could occur if criminals are not interested following rules and are not particularly safety conscious. This seems like the most likely scenario. A recent poll conducted AU’s Women and Politics Institute, and Loyola Marymount University professor Richard L. Fox shows that 60% of high school and college students are considering owning a gun in the future, with 40% planning on it. I couldn’t find any details about the poll, and there is a huge difference between contemplating an action and actually undertaking it. However, it does indicate that many millennials are not reflexively opposed to the idea.